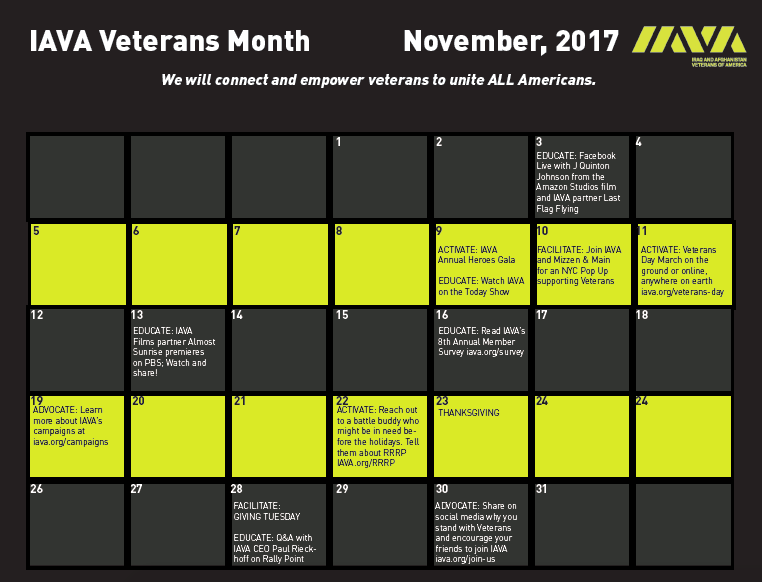 This year, IAVA is proud to launch Veterans Month. Our goal is to connect and empower veterans to unite all Americans at this unique time and moment in history. We’re also educating the whole nation through IAVA films. Click here to learn more about the IAVA endorsed film Last Flag Flying. And share with your friends! Learn more about IAVA endorsed films to watch and share this veterans day at iava.org/films. 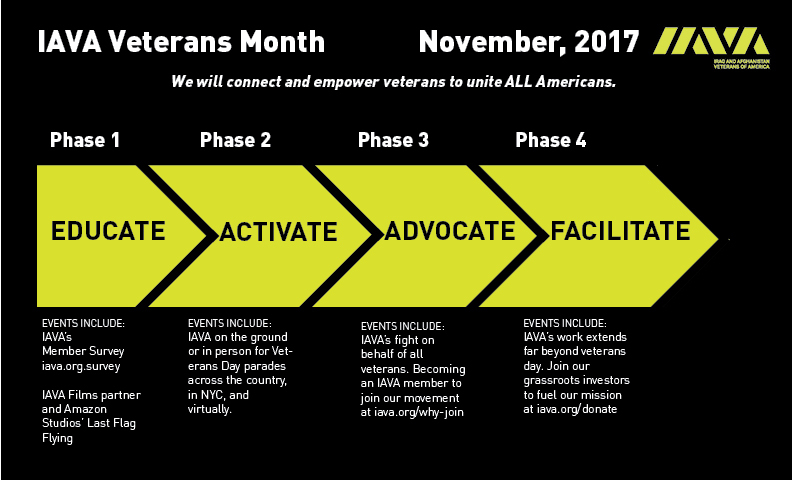 This month, join IAVA for Veterans Day marches: on the ground or online from anywhere on earth! Sign up and tell us, who do you march for? Find a Veterans Day Parade in your neighborhood! List a Veterans Day parade or VetTogether in your neighborhood! IAVA is committed to advocating with and for veterans. As always, IAVA is fighting for issues ranging from education to suicide prevention to VA reform. Our priorities are outlined in our comprehensive Policy Agenda. And this year, we’ve launched our most ambitious campaign yet: She Who Borne the Battle. After Veterans Day, IAVA will continue its fight to defend the GI Bill, combat suicide, reform VA, and for recognition and services for women veterans. Become an IAVA advocate today. This work is not possible without help. Fuel for our mission helps us connect, unite and empower Post-9/11 veterans. And as we always say, veterans are an investment, not a charity. Before Giving Tuesday, learn about how you can get involved and become one of our grassroots investors.